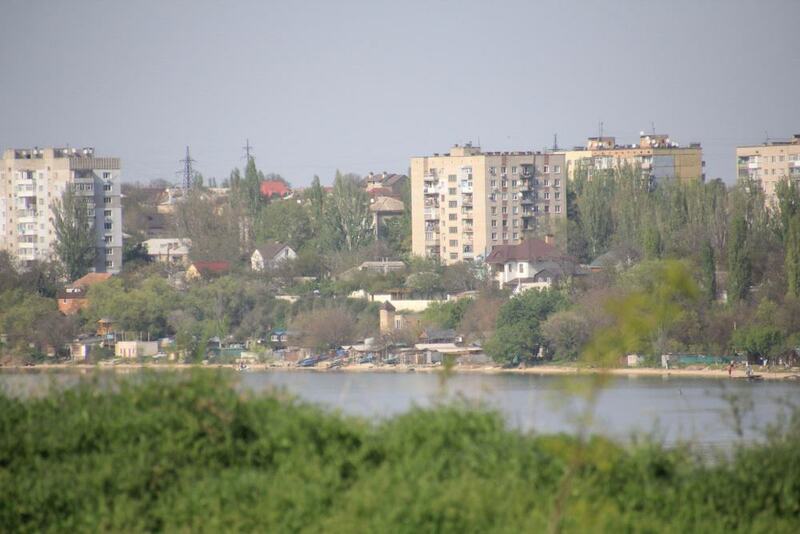 At the confluence of the Inhulets and Southern Bug Rivers, Mykolaiv is a port and shipbuilding city where the Black Sea Fleet was assembled in the 19th century. Mykolaiv’s history begins in 1789 when Grigory Potemkin ordered a port here after Russia acquired new territory on the Black Sea following the Russian-Turkish War. The city was built according to a bold urban plan, so has wide, leafy avenues and fine architecture in a Russian Classical style. 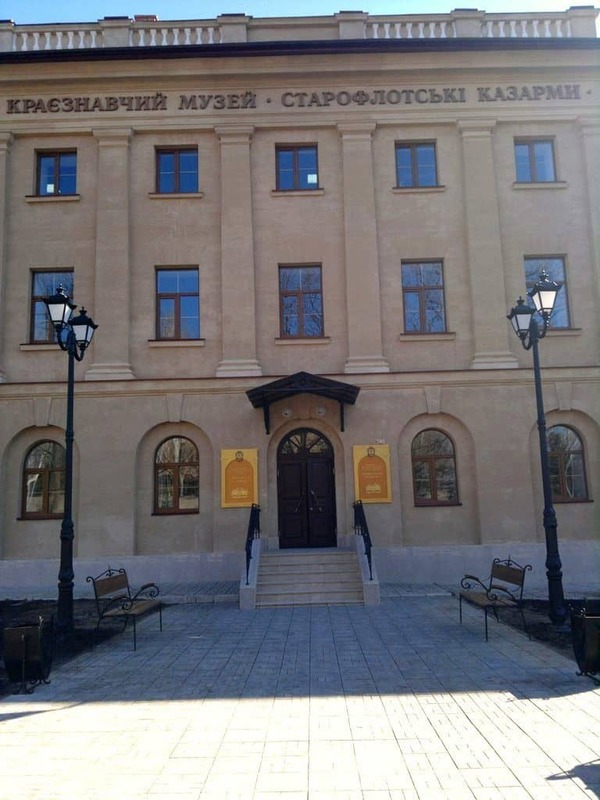 The former headquarters for the Black Sea Fleet, known as the Admiralty, is a whole neighbourhood of striking 19th-century buildings, one holding a compelling museum about the city’s shipbuilding tradition. Maybe the best spot in Mykolaiv for a wander is the old naval complex near the left bank of the Inhulets River. Only a few of the buildings are open to the public, but they’re all in the 19th-century Russian Classical style and once were used as barracks, an officer’s club and command centre. The main building at the east side of the enclave is one of Mykolaiv’s postcard images and now the seat of the city council. The square in front is a grand, sweeping space and used to be the site of a Lenin statue, torn down in a recent “decommunisation” campaign. By the gates is a statue of the fabled Grigory Potemkin, statesman under Catherine the Great and Mykolaiv’s founder. In the Admiralty, this Russian Classical building was the seat for a long line of Black Sea Fleet commanders from 1794 to 1900. In 12 rooms there are almost 3,000 objects on shipbuilding and navigation on the Black Sea, Ukraine’s rivers and the Mediterranean. This starts in antiquity and also covers the Kievan Rus in medieval times and the Zaporizhian Cossacks in the early modern age. You’ll see Mykolaiv’s military shipyards at their peak in the 19th century in a massive diorama. 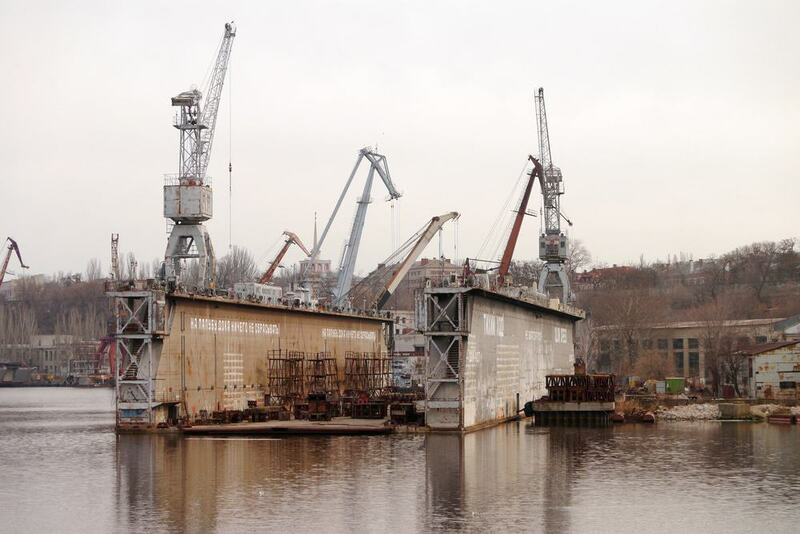 The city’s extensive civilian shipbuilding activity in the 21st century is also revealed, at companies like “Shipyard named after 61 Communards”, which has been in business since 1788. Over the Inhulets River on the north side of the Admiralty is a green promenade where you can continue your saunter around the city. From this green balcony you’ll have a good perspective of the cranes in the “Shipyard named after 61 Communards”. The boulevard is also clustered with war monuments and statues of famous figures from the city’s early days. One of these is Miklhail Faleev, the 18th-century merchant who put up the finances to build the city’s first shipyards. As thanks for that gesture he is remembered as Mykolaiv’s first citizen. Set on Faleevskaya Street, Mykolaiv’s orthodox cathedral is hard to miss for its bright blue dome, spire and Classical facade. The cathedral was started in 1803, but progress was slow as the Greek merchants who initially funded construction moved to Odessa after Mykolaiv was closed to foreigners during the reign of Paul I. It was eventually completed in 1817 and unlike many churches in Ukraine was only shut down for a short time during the Soviet period. Services began again during the Second World War and continued until the fall of the USSR. For that reason it has kept hold of its 19th-century frescoes, which is quite rare in Ukraine. In 2012, this museum moved into a new home in the northern wing of the Staroflotski Barracks. In its time this building in the Admiralty was able to house up to 2,000 sailors. 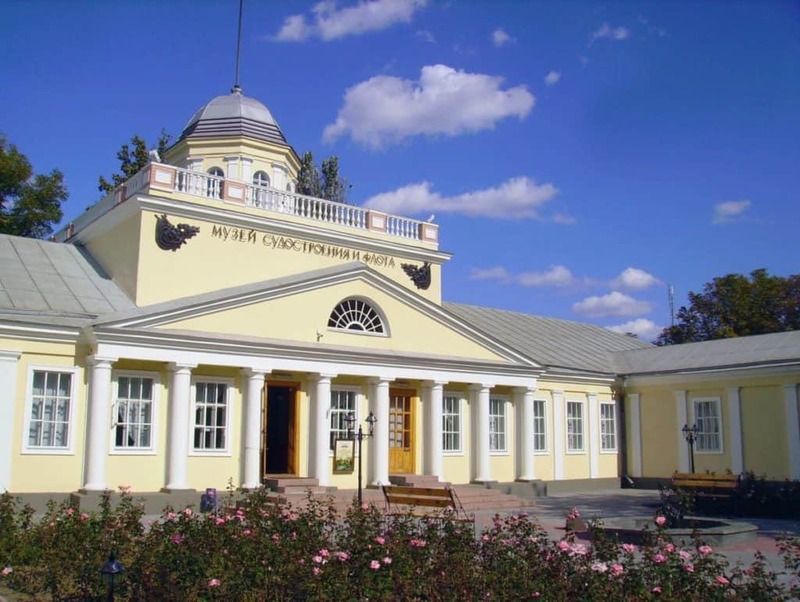 The museum’s trove of archaeological artefacts, geological and animal specimens, costumes, models and photographs from around the Mykolaiv Oblast was first put together in 1913. It all helps to recall important chapters in the region’s past, running in chronological order from Ancient Greek colonisation, to the Kievan Rus, the time of the Cossacks and the city’s development as a multicultural shipbuilding base in the 19th century. Vasily Vereshchagin was a Russian war artist, working in the second half of the 19th century and covering the Russo-Turkish War in 1877-78. His paintings are noted for their violent realism, and the exotic landscapes he recorded in India, China and the Philippines near the end of his life. In 1914, a decade after Vereshchagin passed away, this museum was founded in his memory and has a number of his paintings, alongside pieces by other artists that have been donated over the years. There’s a rich assortment of Russian art from the period by the likes of Ivan Aivazovsky, Rufin Sudkovsky and Mark Antokolsky, but also western art, on show in a separate gallery. 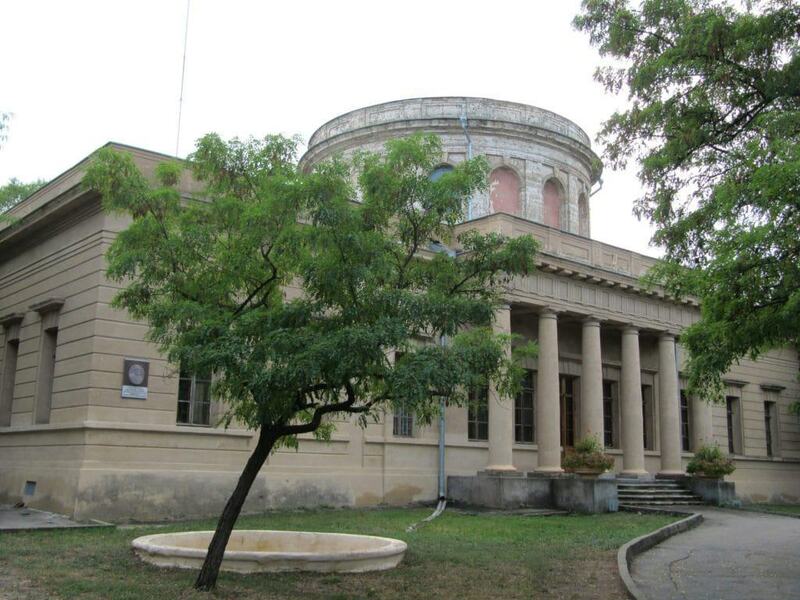 One of the first observatories in Eastern Europe, and the first in Ukraine, this facility was created in 1821 for the Black Sea Fleet to aid orientation and time-keeping. The observatory sits at a height of 50 metres in the centre of the city and still conducts research on the dynamics of bodies in the solar system and research of near-Earth objects. The museum has more than 150 items, among which are antique astronomical clocks, charts, telescopes, sextants, books and chronometers. There are also portraits of some of the personalities associated with the observatory over its 195-year history. 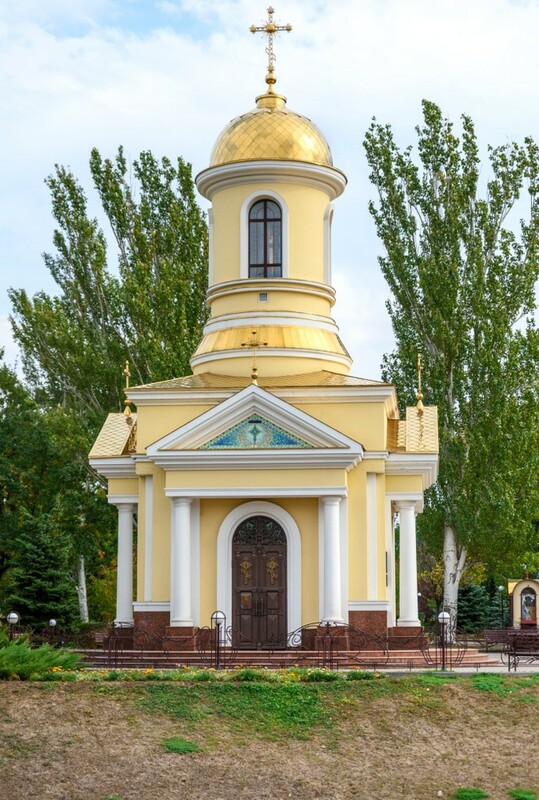 There has been a Catholic congregation in Mykolaiv since the city was founded at the end of the 18th century. In those times there were numbers of Belgians, French, Poles and Italians working in the city. The current St Joseph’s Church was built with bricks in the first half of the 1890s. The architecture is Eclecticist, and has hints of Romanesque and Gothic Revival. The stained glass windows were crafted in Germany: Three in Munich and two in Freiburg, and drench the nave with colourful light when the sun shines. 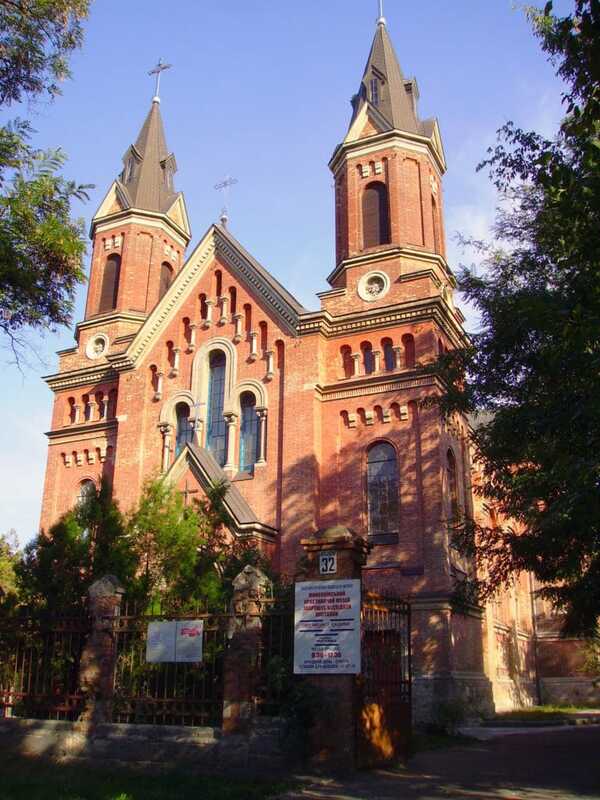 During the Soviet Period the church was repurposed as an administrative building for the “regional department of vocational education” before being re-consecrated in 1992. On Lyahina Street, this museum about Mykolaiv’s underground partisan movement in the Second World War (Great Patriotic War) is in a splendid Russian Classical mansion. The location has its own tale to tell as it was used by the Cheka secret police for a time, and on the facade is a memorial plaque for Victor Alexandrovich Lyagin, an NKVD operative who was executed by the Nazis for fighting with Partisans in 1943. The museum is loaded with propaganda posters, photographs, footage, maps, weapons and a motorcycle, all from the Second World War in this region. A couple of blocks down from Lyahina Street is a public park for youngsters, laid out in the 1980s on the site of the city’s former marketplace. Most of the amusements in the park are inspired by fairytales, like the carousel with a mermaid from Alexander Pushkin’s poem. The park pays homage to Mykolaiv’s shipbuilding history, building a replica of its first sailboat the Buyan, which kids can pretend to sail. There’s also a ferris wheel, fairytale castle, racing track and a genuine steam locomotive that has been made safe for little ones to play on. 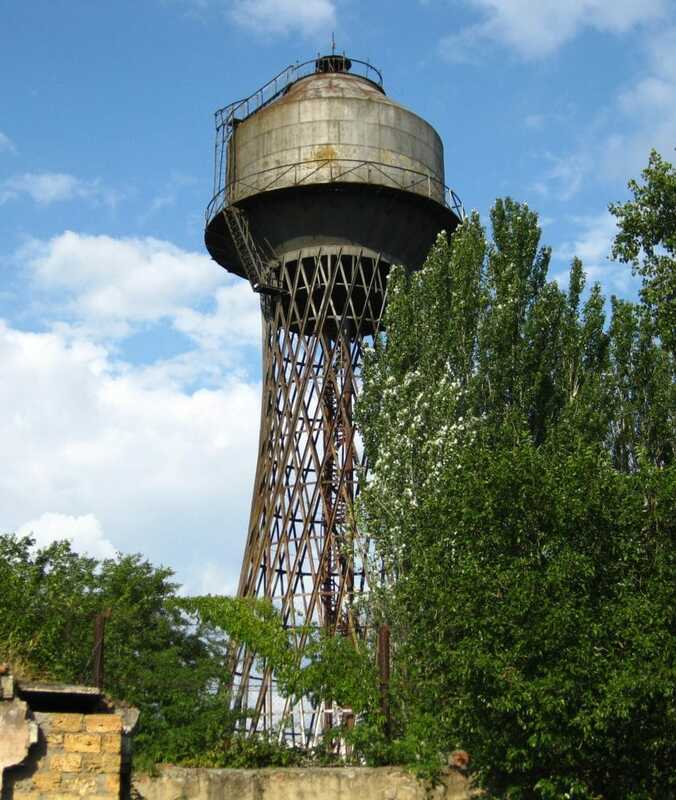 At one of Mykolaiv’s highest points is a water tower designed by the legendary Russian engineer and architect Vladimir Shukhov. It has the trademark hyperboloid structure that Shukhov pioneered and is one of the earliest examples of this design, dating to 1907. More importantly at that time, it also solved a water supply crisis towards the end ofTsarist rule. The tower, 26 metres in height, was finally made obsolete in the 1950s when a new system drew water from the Inhulets River and now stands as a monument to its famous designer. 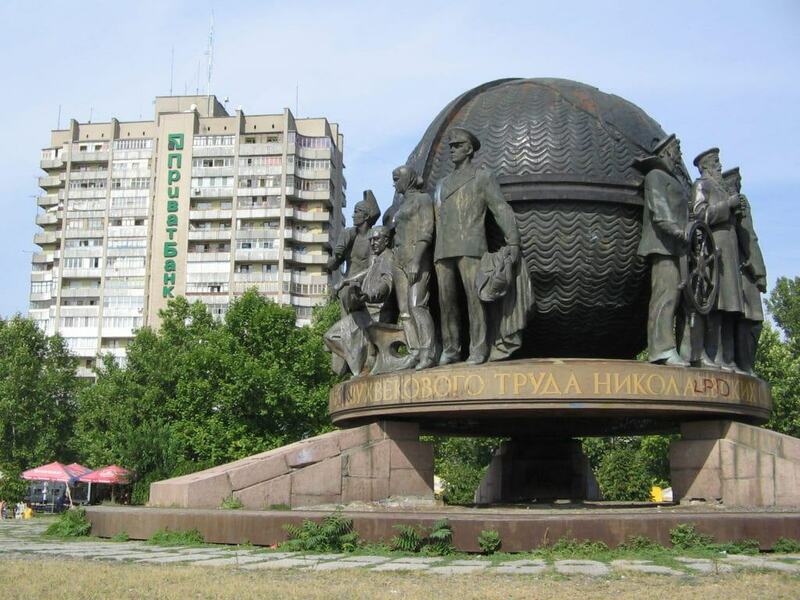 On Admirala Makarova street is an impressive monument paying tribute to Mykolaiv’s shipbuilders and sailors. The sculpture was installed in 1989 on the city’s 200th anniversary and has graced Ukrainian stamps. The piece is charged with symbolism, and is composed of a globe surrounded by 11 bronze statues. Each of these represents a different walk of life associated with the shipbuilding industry, from welders to navigators and military commanders. The globe is also supported by three platforms, each representing one of Mykolaiv’s three shipyards. 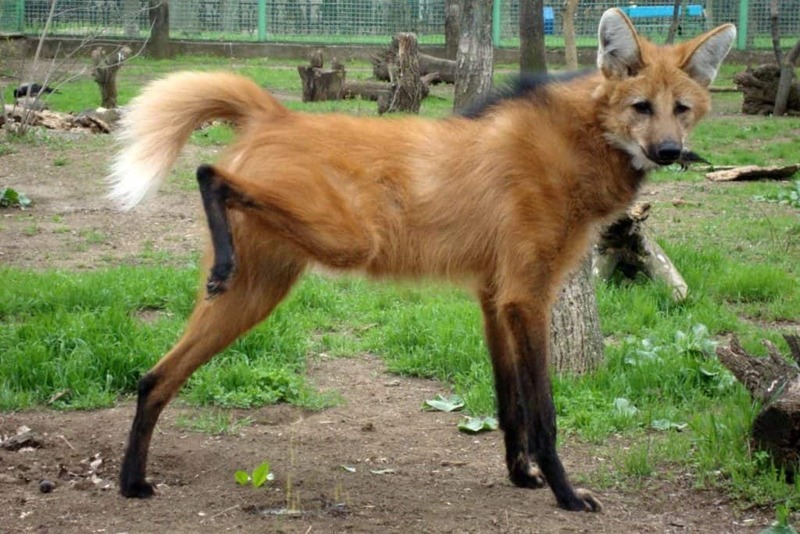 Often cited as one of the best animal attractions in the Ukraine, Mykolaiv Zoo has 5,500 inhabitants from more than 500 species. Children will be most excited about a visit, getting to see big cats like lions and tigers, as well as a pair of polar bears, African elephants, meerkats, wallabies, wolves and many more of their favourites. The zoo also has the ever-popular farm area where kids can meet and pet goats and gentle Bactrian camels. If you track the course of the Southern Bug River down to its estuary you’ll come to an enthralling archaeological site outside the village of Parutyne. 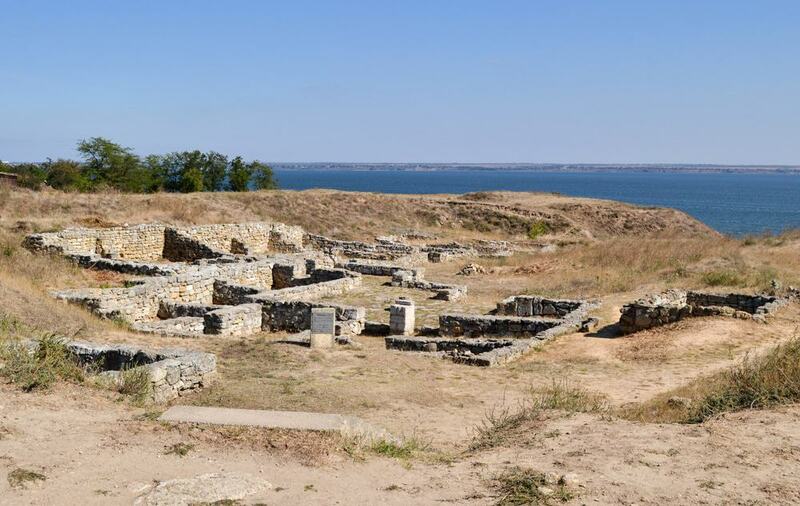 There are ruins right beside the Black Sea, surrounded by steppe. Olbia goes back to the 7th century BC when it was settled by Ancient Greek colonists from Miletus. Over the next 1,000 years it was a major trading post between Greece and Scythia to the north, exchanging grain and slaves. The site covers around 50 hectares and was first excavated at the start of the 20th century. 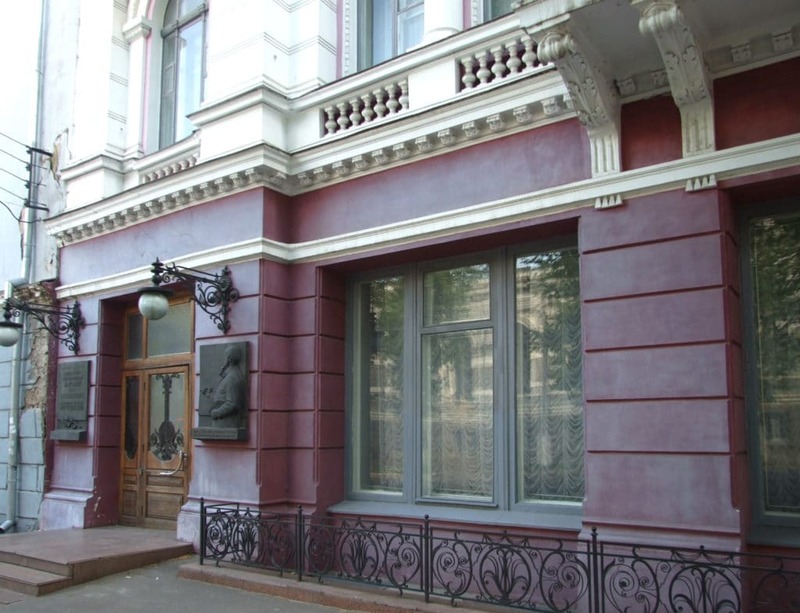 Many of the finds have ended up at Mykolaiv’s Regional History Museum. 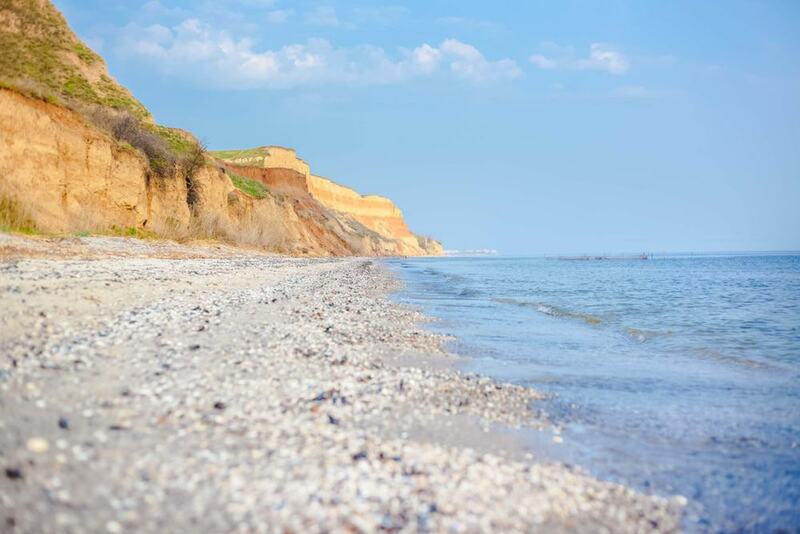 When the sun is out in summer, the Black Sea coast is close enough for a day at the beach. The nearest big resort is Kobleve, under an hour to the southwest. Kobleve’s main appeal is the long ribbon of white sand, all bordered by restaurants, bars and nightclubs. To keep younger family members entertained there’s also a waterpark that has a variety of slides for both younger kids and teenagers. The resort also boasts a Nemo Dolphinarium, staging two dolphin shows a day.